4-17-00 - DREAM - I was managing an apartment somewhere, probably Milwaukee, WI. I got a telephone call from an old friend. He said he had some things to tell me, but he got a visitor and had to break off the conversation. At the same time, I also got a visitor. He said that he would call me back and leave the message on the answering machine. I said, "Okay!" There was another knock at the door, and I said, "Who is there?" rather than just open the door because it was late at night. The man on the other side of the door started telling me a sob story about a lost dog, so I went to the door, opened two chains and let the man in. His wife and two daughters were with him, so they all came in. He wanted to tell me his sad tale of the lost dog, but the kids were rather noisy so I took his daughters to a back room that was full of toys. Another woman who used to live in this same apartment went with us. She couldn't believe the amount of toys in the room. There was actually no room to walk on the floor. The toys were spread all over the floor. The woman described to me that she used to have a game table in this room and kept trying to find a good spot to put it because there were no free corners in the room. Every corner had either a door or a built in piece of furniture like a curio cabinet. I left the kids in the room with the woman and went back to hear the sad lost dog story. The man told me that he had gotten the dog from the pound. The dog had originally been a lost dog to start with. He took the dog home but couldn't bring it into the apartment because we didn't allow dogs in the apartment, so left it outside. So then the dog left and the man had wandered the whole neighborhood and couldn't find the dog. I asked him if he had called the cops and he told me that the cops didn't have time to look for a lost dog. I asked him if he had thought about gathering a search party of interested neighbors, that the dog might show up that way. I saw a map about finding the dog. It looked rather like a star map, and rather like a sign I saw in a meditation last year. It resembled a hunter with bow and arrow. We got interrupted by another phone call. This time is was my old boss. They had found a computer disk in the office that was labeled W/INDOWS. He was confused by the / between the two letters. Once they got the file opened, he saw that there was a story on it. I told him, "Yes! I wrote the story. You can go ahead and read it." I was concerned that he thought that I had written the story during working hours but he didn't accuse me of that. Meantime, the television was on and there was a film playing of the same computer disk story that I had written. In the film, there were characters that turned from humans to very Reptilian creatures with long beaked faces. No two creatures were the same. In the film, the creatures came to the door as humans and then turned into Reptilians. At the exact same time, the man's two daughters came into the room, went out the door, then knocked to get back in and when we answered the door, the girls seemed to be wearing masks I thought of the exact same creatures that were in the film on the TV. It was rather shocking to see this. Then I wondered if I had written about something real rather than fiction. 4-16-00 - VISION - I saw a web page indicating I should scroll down 5 more sites. 4-16-00 - DREAM - I and my brother agreed to make a trip across the valley to find the lost dog. I looked out the window and it was already getting dark. I was quite worried because we were going to ride bicycles. I knew it would be too dark to get back home safely on a bicycle. He turned and confronted me and said that I should trust him because he had a 'light' on his bicycle and if I stayed with him, I would always be safe. To go on this trip, we had to cross a great 'divide' and I had to wheel my bicycles on one wheel while carrying the other end. My brother carried his bicycle upright. With me behind my brother, our bicycle wheels formed a line like the belt of orion. The back wheel of my bicycle was on the ground, my front wheel and my brother's back wheel were together revolving as we walked so that the spokes flashed together like one great wheel. His front wheel was a little off line up in the air. While we were walking, I was on the right and he was on the left. When we got to the other side of the great divide, I saw a man dressed all in brown like an indian on the other side of the divide. He was making an announcement like a radio announcer with a booming voice and I decided I would have to listen to his show later on. We walked carefully along a narrow ledge on our side of the divide, then entered a large building where we crawled on our hands and knees into a woman's apartment through a low doorway underneath her sewing machine which was up against the door. She didn't know this door was open and unlocked. We were still wheeling our bicycles with us. We were using her apartment for a shortcut to where we were going. I got very nervous because she was laying flat on her back in a great bed in her bedroom which was between this small secret door and her livingroom front door. I thought I knew this woman as 'Ruth'. The room was lit but still quite dim ... just enough light to see her lying there in a blue glow. My brother and I cut around to a series of rooms to the right so she didn't see us. By using the path to the right, we made it through the apartment and out the front door into the dark night. 4-16-00 - DREAM - I was again standing in the great divide, ready to go through the secret door of the woman's apartment. I was shown a drawing of a map on a small piece of torn white paper showing where someone had built a large house across the end of the valley, blocking the natural flow of the water. The wisdom of this building was under investigation; the building permit possibly to be withdrawn. 06h 45m 09.25s -16 42' 47.3"
Double star; period: 18295.4 days. As planet Earth revolves around the sun and the globe’s tilt brings longer days, we move into spring. Spring is the last chance to view the constellation, Orion. Sometimes called Orion the Hunter, this constellation is the easiest to identify after the Big Dipper. First find the North Star, Polaris which is directly north. Then, turn full around 180 degrees to face the south. Looking up you cannot miss Orion. It is a big constellation, made up of bright stars of different colors. Identifying Orion is found by looking for three similar stars in a row which is Orion's belt. Follow the line of Orion’s belt to the left to find the bright glow of Sirius, the brightest star in the night sky. Sirius is one of the closer stars, a little over 8 light years away. Our Sun is 8 light minutes away. This makes Sirius a half a million times farther than our home star. At magnitude -1.5, Sirius is often mistaken for a planet, but is rather a blue-white main sequence star. Its surface temperature of over 10,000 K, luminosity 22 times that of the Sun and distance of only 8.6 light years from Earth combine to secure its place as the brightest star. Canis Major represents the larger of two dogs following Orion. It is one of the most prominent constellations, and contains Sirius, the brightest star in the sky, M41, a large & bright, naked eye open cluster containing around 80 stars with an integrated magnitude of 4.5, and NGC 2362 a compact cluster of around 60 stars surrounding Tau Canis Majoris. 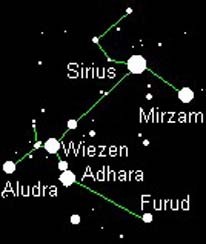 Sirius features strongly in various legends, including the religion of ancient Egypt. Principal stars are: Sirius - The Dog Star (Alpha Canis Majoris), magnitude -1.47; a binary star. The companion, Sirius B is a white dwarf, magnitude 8.5, too faint to be easily seen in the glare of Sirius; Adhara (Epsilon Canis Majoris), magnitude 1.5; Wezen (Delta Canis Majoris), magnitude 1.8 Mirzam (Beta Canis Majoris), magnitude 2.0, a pulsing blue giant. The variation is only a few hundredths of a magnitude; Aludra (Eta Canis Majoris), magnitude 2.4. The entire Sirius Binary System is also surrounded by an Oort Cloud, a cometary belt of small ice/methane bodies very similar to the one surrounding our own system but of only about half the density. This Oort Cloud orbits at about 50,000 AU from the star. Follow the three stars in Orion’s belt to the right, you will see the V-shaped constellation Taurus the bull, with the bull’s red eye being the star Aldebaran. Slightly farther to the right is the Pleiades, a faint gossamer pattern of bright blue stars best seen by looking near, but not directly at the constellation. Hanging from Orion’s belt like a sword is the Orion nebula, a nursery of newly born stars. Below and to the right of the belt is the hot blue giant Rigel, quickly burning up its fuel. Its life will be short, just a few millions of years, as compared to the 10 billion year life of the sun. When the sun does die, it will look something like Betelgeuse, the red star on Orion’s upper left side. Betelgeuse is gigantic, swollen to 1,000 times the diameter of the sun as it dies of old age. In five billion years our sun too will swell malignantly and it will turn to ash all life on our now blue planet. But, just perhaps, new eyes will be being born on planets near the stars now just coming to life in the stellar nursery hanging from Orion’s belt. Watch for Orion lower and lower in the sky as it gets toward summer, in the west after sunset, the three stars of the belt hang parallel to the ground. After that, Orion will not be seen again until early mornings in late summer, when the appearance of Sirius, the Dog Star, announces the dog days of August. The Egyptians associated the appearance of the Dog Star with the flooding of the fields and the birth of a new year. Later, the Greeks and Romans associated the Dog Star with Orion, The Hunter, and his two hunting dogs Canis Major and Canis Minor. The Greeks named the constellation Sirius, "the Scorcher" as they believed the Dog Star was responsible for the hot weather and listlessness that plagued them in the summer months. More amazing is that the Dogon of Mali, have had an excellent understanding of the solar system, particularly the Sirius Star System. The Dogon, in addition to plotting the orbits of the stars circling Sirius, identified one of its companions-Sirius B-as being one of the densest and tiniest stars in our galaxy. The most notable aspect of their observations is that Sirius B is invisible to the unaided eye. A photo of this star was not obtainable until 1970. The Dogon revealed their knowledge of the Sirius star system to French Anthropologists in 1930. The Sirius star system was suspected of having more than one star when erratic movement of Sirius, the Dog Star was noticed in 1844. The knowledge of the Dogon of Mali, precedes the knowledge of the ancient Egyptians by hundreds of years. The religious beliefs of the Dogon have been centered around the Sirius star system for thousands of years. Western scientist are just now beginning to prove that the knowledge the Dogon of Mali have had of the Sirius star system for thousands of years is absolutely accurate. Dogon people live on the Bandiagra Plateau, about 300 miles south of Timbuktu, Mali from about the year 200 BCE. The Dogon believe that they received their culture from the Nommo, an amphibious race of space entities who come from the star system Sirius, 8.7 light years from our Sun. In 1946, French anthropologist Marcel Griaule was initiated into the ancient Dogon religion. Central to it's belief it that Sirius, the Dog Star, has an invisible companion star, many times denser then Earth, that travels in an elliptical orbit around SIrius once every 50 years. The existence of this companion, an enormously dense, 'white dwarf' known as Sirius B, was first suspected by astronomers only in the 1830s and then first seen through a telescope in 1862. In 1926 it's super dense nature was revealed. The anthropologist was certain that the Dogon already knew the details of Sirius B when he went among them. To him, there appeared to be no possible way in which the Dogon tribesmen could have discovered these things except in the way that claimed--from Nommo, who arrived on Earth in 'arks' centuries before. Critics point out that the Dogon knowledge of the Sirius system is not as accurate as it would seem. They say that Sirius B orbits Sirius A once every 60 years not 50, and astronomers have found no evidence so far that supports Dogon belief of a third star, or several planets also said to revolve Sirius A.
Dogons have for thousands of years possessed a knowledge of the existence of Sirius's companion star, a white dwarf star called Sirius B. Furthermore, they knew of its status as a dwarf star, for in their legends they referred to it as "small and heavy." Yet Sirius B is totally invisible to the eye, in addition to which it is obliterated by Sirius A. In fact, only in the last century was the existence of Sirius B revealed to Western science with the aid of the telescope. Even more striking, the existence of twin stars and white dwarfs in itself constitutes new concepts in the annals of modern astronomy. Despite this, the Dogon have for centuries had an accurate knowledge of the orbital period of this invisible star. They not only know that it is very small and dense and rotates on its axis (as do all stars, a remarkable bit of knowledge for a "primitive" people to possess), but also claim to know the period of its rotation, which modern astronomers have not yet ascertained. meaning. Some scholars prefer to see here a designation of the Belt of Orion, but it seems to be just an ad hoc conjecture. On the other hand, the name "three stars" is quite justified in terms of the Dogon concept of this stellar system. There is, by the way, a direct relationship between the word "Tishtrya" and the name of the hellish dog Cerberus. Thus, there are in various parts of the world some traces of an ancient -- and rather clear -- concept of Sirius as a dangerous stellar system, consisting of three stars. Its transformation has been described, first, as the transition from Typhon (a fiery monster in rage, that is a red giant before its change into a Supernova) to Orphrus (a dangerous but suppressed beast, that is the core of the red giant in the process of its "calm" turning into a white dwarf). Second, the Dog is usually chained up by sacred blacksmiths, which can be interpreted as a description of astroengineering activity by a supercivilization. Nommos are also considered as heavenly blacksmiths, but they do not chain up the Fox; they simply circumcise him. This rather unexpected metaphor expresses very clearly the main point: it was necessary to remove the excess of stellar matter from Sirius B. The 240 years of increased brightness of the star looks like a slow explosion of this "cosmic bomb". unsolved. It is astrophysically very unlikely that Sirius B could have been a red giant as recently as 2000 years ago; but we cannot rule out entirely the possibility of lasting astroengineering works in this system. In any case, attempts to explain the red color of Sirius by some atmospheric causes are not very convincing. There is some evidence that the epithet "red" was not unusual for Sirius in the past. Thus, Tistrya was called "aurusha", what can be translated either as "white", or as "red". In Egyptian hieroglyphic writing, Sirius was depicted as a red triangle with a small semicircle and a five-pointed star near it . The Babylonians referenced to the star as "shining like copper". Finally, the Dogon represent Po tolo by a red stone (it is precisely Po tolo, not Sigi tolo or Emme ya tolo). Sirius has been identified by some as the Biblical star Mazzaroth (the Book of Job, 38:32). The Semitic name for Sirius was Hasil, while the Hebrews also used the name Sihor -- the latter an Egyptian name, learned by the Hebrews prior to their Exodus. Phoenicians called Sirius, Hannabeah (“the Barker”. ), a name also used in Canaan. Meanwhile, The Dogon Tribe <http://www.mm2000.nu/sphinxv.html>, from the Homburi Mountains near Timbuktu (West Central Sahara Desert in Africa), have an apparent lock on traditions as they were able to describe in detail the three stars of the Sirian system. But ancient Egypt provides the most regal history for Sirius. Initially, it was Hathor, the great mother goddess, who was identified with Sirius. But Isis soon became the major archetype, sharing honors with the title of Sirius as the Nile Star. An icon of Sirius as a five-pointed star (shades of the Golden Mean) has been found on the walls of the famous Temple of Isis/Hathor at Denderah. A Binary Star or star system is a pair of stars that are held together by their mutual gravitational attraction and revolve about their common center of mass. In 1650 Riccioli made the first binary system discovery, that of the middle star in the Big Dipper's handle, Zeta Urase Majoris. True binary stars are distinct from optical doubles—pairs of stars that lie nearly along the same line of sight from the earth but are not physically associated. Binary stars are grouped into three classes. A visual binary is a pair of stars that can be seen by direct telescopic observation to be a distinct pair with shared motion. A spectroscopic binary cannot be seen as two separate stars, even with the most powerful telescopes, but spectral lines from the pair show a periodic Doppler effect that indicates mutual revolution. Some lines indicate motion toward the earth while others indicate motion away; later, as the stars revolve around in their orbit, this pattern reverses. An eclipsing binary has the plane of its orbit lying near the line of sight, and shows a periodic fluctuation in brightness as one star passes in front of the other. The more massive star (A) of a binary is called the primary, and the less massive (B) is called the secondary; e.g., Sirius A and Sirius B are the primary and secondary components of the Sirius system. It seems likely that more than two-thirds of the stars in our galaxy are binary or multiple (a system of more than two stars moving around their mutual center of mass), since many stars within 30 light-years of the sun are binary or multiple. The masses of the components of a spectroscopic binary can be determined from the observed motions and Newton's law of gravitation; binary stars are the only stars outside the solar system for which masses have been directly determined. Binary stars are thus important indicators from which the masses of all similar stars can be deduced. Measurements of the masses of some of the visual binary stars have been used to verify the mass-luminosity relation. Although most binary stars have distance between them, the components of W Ursae Majoris binaries are actually in contact with each other, their mutual gravity distorting their shapes into teardrops. There are binary systems in which one member is a pulsar: PSR 1913+16, for example, has an orbital period of 7 hr 45 min; in this case the other star is also a neutron star. The orbit period decreases as the system loses energy in the form of gravitational waves; used as a clock to measure the effect of the curvature of space-time on the binary's orbit, such a system confirms Einstein's theory of general relativity. Sirius B, was first glimpsed in 1862. White dwarfs are much smaller than main-sequence stars (ordinary stars like the sun) and lack the luminosity of a main-sequence star. They no longer have a supply of energy from fusion and while they may shine with a hot, while light, they will eventually fade away into cool dark embers. It is believed that the gravity within white dwarfs is what shrinks them to their small size. This gravity produces high gas pressure as well as high density. The stars become so dense that a tablespoon of their gases would weigh tons if measured on the planet earth. Two white dwarfs include van Maanen's Star and Sirius B.
Density. The ratio of a body's mass to its volume.The density of water is 1000 kg/m3 ; the Sun is about 1400 kg/m3; a white dwarf (like Sirius B) 4 x 109 kg/m3; a neutron star around 1017 kg/m3. If the density of the universe is greater than 2 x 10 -26 kg/m3 (about 12 nucleons/m3) then the expansion will cease and a Big Crunch ensue. Planets: None survived the when the star went "Nova"
The most famous white dwarf is Sirius B. A companion star to the bright star Sirius, the Dog Star (Sirius B has been given the nickname `the Pup'). But if Sirius B is a white dwarf now, it must've been a real star in the past. In fact, that it became a white dwarf first, Sirius B must have once been the bigger and brighter of the two stars! There is an upper limit to the mass a white dwarf can have. The most mass a white dwarf can have is 1.4 solar masses. This is called the Chandrasekhar Limit. A teaspoonful of matter from a white dwarf has a mass measured in thousands of kilograms. That is approximately the same as a truck loaded with bricks. * This is Sirius B. It is a white dwarf. Champollion (1790 - 1832) unravelled the secrets of Egyptian writing but so far nobody has demystified Egyptian beliefs. Astrophysics is the key. 11,650 year ago, a supernova exploded close to Earth in the direction of Orion's Belt. It became the god Osiris who donated metals and resembled a scarab beetle (expanding nova). Twenty-eight years later the binary star Sirius B (the god Horus) exploded, sending a plasma tongue looking like a fiery dragon or winged serpent (Seth) speeding towards Earth. The northern hemisphere was devastated; the Ice Age ended abruptly and many animal species became extinct. Surviving humans realised their fate was determined by stellar explosions - new suns in the night coming and going as though they had inherited the spirit of the sun (Ra). The idea that Osiris assumed the essence of the sun, later passing it on to his son Horus (whose mother was Isis, the surviving binary star Sirius A) gave rise to the idea of resurrection. This solution also enables us to understand many of the enigmatic passages in the Bible, such as Revelation 12 and core myths from all other ancient civilisations. Religious monuments commemorate these traumas. The Great Pyramid vectors in the star Sirius and a vanished star in the direction of Orion's Belt. Snake mounds, medicine wheels, Nazca images and Mesoamerican buildings, representing versions of the approaching and rapidly changing plasma configurations, are oriented towards the heliacal rising of Sirius at solstice. Blood sacrifices were instituted to placate the vengeful celestial apparitions, worshipped in many ways and incorporated animistic symbolism - birds, winged angels, fiery phallus, serpents, dragons, lions, scorpions, beetles, horns, etc. This is all consistent with religious syncretism throughout the ages, culminating in the adoption of a single deity in some cultures. Saintly haloes, the nimbus or crown and irrational millennarian apocalyptic prophecies all hark back to the shocks experienced 11,650 years ago (massive flooding, consuming fire, earthquakes, displaced firmament and '"falling stars", etc). It is a fact that the human species was almost wiped out by a plasma shockwave. The subliminal memory lingers on in many of our unrealistic belief systems. In 1844 the German astronomer Friedrich Bessel studied the motions of the brightest star in the sky, Sirius, and found that it was being perturbed back and forth by a faint, unseen star orbiting around it. This star was not glimpsed until 1862, when Ameri can telescope maker Alvan Clark detected it. It is almost lost in the glare of Sirius, as shown in Figure 19-10. In 1915, Mt. Wilson observer W. S. Adams discovered that it was a strange, hitherto-unknown type. It is hot, bluish-white, and lies below the main sequence on the H-R diagram. It has about the mass of the Sun, but it is so faint that its total radiating surface cannot be much more than that of the Earth. Sirius is actually the brightest star in the sky. It is nine light years away, not particularly close. Often, it is called "the Dog star." And not coincidental to Temple's inquiry, its cycles were closely followed by the ancient Egyptians. The Sirius Mystery takes a scholarly look at the question of whether Earth has, in the past, been visited by intelligent beings from the region of the star Sirius. Horus is associated to Sirius. Heru Ami Sebtep, which means Horus of Sirius and Heru Sept means Horus of the Dog Star (Sirius is in Canis Major, the major dog). Since Neb Heru is Nebiru, the sign of Sirius is the cross as well. This crossing of the plane of our solar system and of our galaxy is unique in local history and the ending of this alignment occurs in May-July 2000. On the 5th of May, the alignment of the planets is fulfilled, some with 16 degrees of each other, the other side of the sun to us. At this moment of strong gravitation 'tug of war', there is the end of the alignment of the 90° cross of our solar system with the galactic plane. To Egypt, the 23rd of July, when Sirius starts to rise the waters of the Nile begin to flood. Then it meant fertility, that is one reason, for she was Isis. Sirius, Isis, the great mother of the gods. Even the Swiss celebration day, is the 1st of August. This is a Sirius relative. Our solar system is born in from the womb of Isis. Sirius B, which is Isis , is made of iron (radio astronomy has shown). The iron of Sirius b, is the same as the iron in our blood and the iron of Earth and of our solar system. Sirius is our blood. We resonate to her. She is older than our solar system, which is a combination of interstellar debris, including the gas clouds, our sperm of Osiris/Orion. The iron in our blood comes from Sirius, its position in the sky, could thus be considered to resonate to Sirius's position of influence. Iron is the only true magnetic element. August the 12th and 13th is the high point of Sirius. Nebiru (Neb Heru) in the sky. Nebiru is the sign of the cross within a cross. The cross of our solar system to the galaxy, to the star system of the cross, which is Neb Heru (Heru Ami Septeb, Horus of Sirius or Heru Sept, Horus of the Dog Star). - At midnight of the autumnal equinox in the year of the Great Pyramid's completion, a line extending from the apex pointed to the star Alcyone. Our solar system is thought by some to revolve around this star along with other solar systems much like the planets revolve around our sun. - North Star Pointer: The Descending Passage pointed to the pole star Alpha Draconis, circa 2170-2144 B.C. This was the North Star at that point in time. No other star has aligned with the passage since then. - The 344 ft. length of the Descending Passage provides an angle of view of only +/- 1/3 of a degree. Alpha Draconis has not been in alignment for thousands of years. The next alignment will be with the North Star, Polaris, in about 2004 A.D. Polaris in Greek means "Satan". - The southern shaft in the King's Chamber (45 deg, 00 min, 00 sec) pointed to the star Al Nitak (Zeta Orionis) in the constellation Orion, circa 2450 B.C. The Orion constellation was associated with the Egyptian god Osiris. No other star aligned with this shaft during that Epoch. - The northern shaft in the King's Chamber (32 deg, 28 min, 00 sec) pointed to the star Alpha Draconis, circa 2450 B.C. - The southern shaft in the Queen's Chamber (39 deg, 30 min, 00 sec) pointed to the star Sirius, circa 2450 B.C. Sirius was associated with the Egyptian goddess Isis and is also part of a unique ceremony practiced by the African Dogon tribe. - The northern shaft in the Queen's Chamber (39 deg, 00 min, 00 sec) pointed to the star Ursa Minor, circa 2450 B.C. - Pyramids mirror Orion Constellation: The pyramid positions on the ground are a reflection of the positions of the stars in the constellation Orion circa 10,400 B.C. Five of the 7 brightest stars have pyramid equivalents: The 3 great pyramids of Khufu, Khafra, and Menkaura for the belt of Orion, the pyramid of Nebka at Abu Rawash corresponds to the star Saiph, the pyramid at Zawat al Aryan corresponds to the star Bellatrix. The only two missing star positions are for Betelgeuse and Rigel. Egyptian pyramid texts ("The Book of the Dead") identify the destination of the soul after death (which they called Duat) with the stars in the northern sky, near the pole star. The circumpolar stars never dip below the horizon at any time of year. The Egyptians called the circumpolar stars the indestructibles, or imperishables. Other constellations away from the pole star rise in the east and set in the west. They also disappear and reappear with the seasons. The most easily recognized seasonal constellation is Orion, which the Egyptians identified with their great god Osiris. Osiris had been murdered by his brother and resurrected; he was the god of regeneration and rebirth. Osiris caused the sun to be reborn each night, so it could rise again the next morning. Osiris also was supposed to bring the Nile flood which began the new growing season. Osiris presided over the judgment of souls after death; an Egyptian pharoah who reached Duat was said to become an Osiris. Clearly the ancient Egyptians took astronomy seriously. The locations of the great pyramids at Giza show that the ancient Egyptians were capable of very accurate astronomical observations. The Egyptians were probably the first to adopt a mainly solar calendar. They noted that the Dog Star, Sirius, reappeared in the eastern sky just before sunrise after several months of invisibility. They also observed that the annual flood of the Nile River came soon after Sirius reappeared. They used this combination of events to fix their calendar and came to recognize a year of 365 days, made up of 12 months each 30 days long, and an extra five days added at the end. But they did not allow for the extra fourth of a day, and their calendar drifted into error. Each spring equinox in the northern hemisphere brings the renewal of Earth's fertility, a time of expectation and regeneration. The seasons are reversed in the southern hemisphere, hence not universals, nor the basis for the zodiac, still they are important seasonal markers. Astronomically we measure the equinoxes in terms of the relationship between the Sun and Earth only, i.e., the Sun's conjunction with the crossing of two planes: the oscillating Earth's equatorial plane and the ecliptic plane between Earth and the Sun, both projected measurements from the Earth. It is important to note that astronomy was 'naked eye' visually pragmatic as well as mathematical. In ancient Egypt, believed by some to be source of the original zodiac, the day began at sunset with the viewing of the night sky. The beginning of the New Year in spring for ancient Egypt's sacred lunar calendar was marked not just by the equinox but additionally by the first appearance of the New Crescent Moon. The first light of the New Crescent Moon seen from the Earth usually occurs within two days after the ecliptic conjunction of the Moon & Sun (which is called the syzygy or astronomical new moon). This syzygy new/dark moon takes place on the 29th day of the Synodic Cycle of the Moon (of 29.5306 days). The almanacs of ancient Egypt & Babylon showed this dark moon as a day of ill omen 'because' eclipses of the Sun took place then. The "29th" degree still has negative overtones astrologically, but the "29th" was originally from the last day of the Synodic Moon Cycle, ie., the dark moon, NOT the ecliptic degree. Apart from their civil & Sothic calendars, the Egyptian priesthood also observed the lunar year beginning with the first appearance of the crescent Moon at sunset about the date of the vernal equinox, and at a period more remote than the earliest known Babylonian record of a similar observance." The Egyptians regarded planets and stars as gods. Mystically these events, the (heliacal) cycles of return and disappearance of the goddesses and gods from the night skies, were invested with great importance. The First Light of any heavenly body visible on the horizon, as viewed from a particular place on Earth, marked a kind of new beginning. Most of ancient religious and philosophic thought about gods and goddesses came from the identification with cyclic forces in our solar system, the lights (i.e., the Sun and Moon) and planets. "The word translated 'exaltations' means in fact 'hiding-places', and the hiding places of a planet are obviously those parts of the zodiac in which it is invisible, and especially the degree in which it disappears from view into the sun's rays at 'heliacal' setting and the degree of its reappearance at 'heliacal' rising. The same is true of the moon, and is proved by the distance of the moon's 'hiding-place' from the Sun's, 14 degrees, which is a typical elongation for a new crescent....these phenomena change their positions every time they occur.... Until the zodiac drew attention to the position of planets in constellations, the chief focus of interest in them was their heliacal disappearances and reappearances..."
The reason is that the diagrams were all for New Year's Day, and the Egyptian year effectively began not on the date of Sirius' 'heliacal' rising, which would have given slightly different dates for different parts of the country, but at the following new moon." The importance of heliacal phenomena in ancient cultures in Egypt and in other than Egypt. For instance, there is an isolated collection of upright megaliths is in northwestern Kenya. The stones were erected in this curious pattern in about 300 B.C., and the site is known as Namoratunga II. Its alignments are consistent with the traditional calendar of the people in the region....These stones at Namoratunga II are not actually devices used to measure the positions of stars. They are too big and too close for that, and calendar keeping by the stars doesn't require detailed mapping of their positions. The date of their appearances and disappearances are significant, however, and the Namoratunga megaliths could have been used as reminders and guides to the stars of calendric importance." The Sumerian calendar's orientation is to the first crescent moon. In Mesopatamia it was probably the Sumerians, the people who built the formative civilization of the region, who put the first formal calendar into use. The Sumerian calendar was lunar, but its months began when the first crescent was sighted in the west. The beginning of astrological history, which seems to have originated in the valley of the River Nile, the Egyptians appear to have regarded LIBRA as the first of the zodiacal constellations. "The earliest era known to us is that of Harakhte (Mars), which commenced on September 15, 3130 B.C. at 4.30 am L.M.T., at which time Spica rose heliacally at Heliopolis, making the ascendant precisely Libra 0 deg 00'. Owing to its south latitude (-2d 02') Spica 'bodily' rose with the beginning of Libra....The Egyptian and Babylonian Lunar year commenced during the dynastic periods, with the first "appearance" of the crescent Moon in the constellation Aries, which marked the lunar "New Year's Day" (1st Nisan), and which began at sunset...immediately after the sun had set, when the opposite constellation, Libra, was crossing the ascendant. Hence, the rising of LIBRA tallied with the beginning of both the Egyptian & Babylonian lunar years. Incidentally, during the same dynastic periods, the Semitic "Civil" year commenced on 1st Teshrit (Autumn) when the Sun had entered the constellation Libra....Although the beginnings of the native and sothic months were determined independently of the date of the crescent moon, yet from the earliest times, the Egyptian ideogram for a month was the well-known astrological symbol for the Moon. This would clearly indicate that the Egyptian year was originally lunar, and like that of the Babylonians and the Hebrews, began with the new moon of Easter." M41 - (NGC 2287) M41 is an easy to find open cluster nearly 4 degrees south of Sirius, the brightest star in the sky. It contains about 100 stars, including several red (or orange) giants, the brightest being of spectral type K3 and mag 6.9, and at the object's center. The stars in this cluster are some of 2,300 light years, and scattered over an area of 38 arc minutes diameter. The age of M41 was estimated at 190 million years (Sky Catalog 2000) This stellar swarm is receding from us at 34 km/sec. C.E. Barns mentions that M41 was "possibly" recorded by Aristotle about 325 B.C. ; this would make it the "faintest object recorded in classical antiquity"
PILOT: I was a navigator in the Aurora program for 12 years. During that time, I was on another planet for 3 years. I've been lecturing for about 3 weeks now. I wrote to Dr. Greer and haven't heard back from him yet. I'm 55 years old now and decided to talk because I don't have much longer to live because of health reasons. The ETs have been here a long time through out history. Early in the 40's, the ETs genetically enhanced 216 children. I am child #9. I worked on a lot of government programs since then, including helping to develop the trip to the moon. I worked on Aurora 3. It can fly at almost the speed of light. I volunteered to do that. Unfortunately, the shielding on the plane from the plasma had a leak and it did a lot of damage to my body. The damage was to all my organs including my skin. My skin actually falls off like powder. The body's molecular structure gets rearranged in a subtle way when you are in space. I was picked up by a mother ship. It took 3 years to get to the planet, spent 3 years there and it took 3 years to get back. ET's can't live in gravity anymore. They can only work in outer space, except for quick jaunts on earth. Abductions are done in family lines for the most part because the are collecting the DNA the originally implanted in human beings a long time ago. The moon we see in the sky is not a real body... it's artificial. 70 feet down is metal. On the dark side of the moon is mining operations and bases. They have a base where they fly from the moon to other star systems 250 light years away. Most ET species are over 10,000 years advanced ahead of us. Some species are even 100,000 or 1,000,000 years ahead of us. They are working to try to get us to have a one-world governmental system. This is starting to happen in Europe now. Communications is the biggest problem. There are too many people with a negative nature. Other advanced planets have had these types of being eliminated. The ETs want only positive oriented beings. They have helped mankind over the century with technology. Unfortunately, other cultures in our history haven't capitalized on it, some only a little. They have given various cultures different things, trying to spread the technology out. They gave rockets to the Chinese first but the Chinese didn't do anything with it but make fireworks and small rockets. The U.S. has made the best progress technologically. We went from the Wright brothers to flying to the moon in only 50 years. That's pretty outstanding. However, they don't want to make the greatest benefits for the greatest amounts of people. The technology has to be trickled out or there won't be any work for people. Dymler-Chrysler is coming out with the new engine which is technology from them. We need more spiritual development because we are too violent. Off worlders believe in the Trinity and God, but there are too many religions here that disagree with each other. The Planet is near Sirius. The planet is about 1/3 the size of earth. There is a lot of water there, but they don't have rain like we do, it's more like mist. The sky is light purple because their sun is not like our sun. Their sun is white and it creates a different light refraction the our sun does. Their sun is a lot smaller than ours too. There are some air breathers there and some methane breathers, which is like going into an aquarium. The planet is actually going around Sirius B. There are 82 races of people on that planet and many other sub-species. It belongs to the United Federation of Planets. Humans are pretty crude in comparison to them. One of the greys who comes here are not very nice, and the beings they work for don't look the same as them. Those greys are more like worker bees. There is a Reptilian group like them too, not very nice. The ETs use thought adjustments on humans during the night. People should watch the movies, " The Day the Earth stood still" also "Independence Day' There are still two hostile groups we are still dealing with. The Triangle Platform craft actually has other crafts inside of it. The craft over Phoenix was a TR-4. There is also a TR-5 which carries the TR-3 and TR-5 inside of it. The TR-5 is a carrier craft. They are building 219 of these craft right now. They are doing a massive cleanup of Area 51 because the Aurora flights did so much pollution there. They are now increasing the size of Area 51 There are also 5 other places where they do some of the work also. The more advanced stuff is in other places. Most of the work being done at area 51 now is cleanup from the TR-2 pollution. NOTE: ACIO is a secret or unacknowledged department of the NSA. It is headquartered in Virginia, but also have personnel in Belgium, India, and Indonesia. They are largely unknown, even to senior directors within the NSA. The ACIO is the lowest profile organization within the entire intelligence community. Its agenda is to research, assimilate, and replicate any technologies or discoveries of extraterrestrial origin. : HEPHAESTIO OF THEBES. COMPENDIUM, Bk I. 380 A.D. Treats of general principles of astrology & universal astrology, blending Ptolemy with Dorotheus and others. Highly interesting delineations of the decans. Also contains a very long excerpt from Nechepso/Petosiris on detailed eclipse delineation. Preserves an ancient Egyptian method of prediction using the Dog-Star alone. This star and Castor are known as the Gemini Twins. These two stars lie nearly halfway between the Big Dipper and Orion. They form a conspicuous matched pair. A line from Rigel through Betelgeuse points to Castor. Pollux, the brighter star of the two, lies immediately below Castor. Remember: Pollux is near Procyon and Castor is near Capella. A line drawn from Pollux to Sirius passes almost through Procyon, the little dog star, which is located to the SW of Orions belt. A large arc can be drawn from Sirius, to Procyon, Pollux, Castor, and then up to Capella. The "pointers" of the Big Dipper lead up to the Pole Star (Polaris) and down to Regulus. This star may be found easily, as it is situated at the end of the handle of the "Sickle" (also the head of Leo, the Lion.) and is the brightest star in the group. The southeastern most star in Orion This Bright star is located immediately to the east of the belt and equidistant across the belt from Betelgeuse. The Dog Star is the brightest star in the sky. The three stars in Orions Belt point directly down to Sirius. A nice arc is formed by Capella, Castor, Pollux, Procyon and Sirius. Piri Reis Map - Who Drew It? When? In 1929 a group of historians found back the map in a dusty shelf, still rolled up and drawn on a gazelle skin. The content of the map was amazing: it focuses on the western coast of Africa, the eastern coast of South America (!) and the northern coast of Antarctic (!!!). The Antarctic remained undiscovered until 1818, but its northern coastline, perfectly detailed, was shown on a map drawn in 1513!!! According to the ancient Egyptians, Sirius is the celestial representation of the goddess Isis, sister & wife of Osiris. She was the most important goddess of all Egyptian mythology, and assumed the attributes and functions of virtually every other important goddess. Her most important functions were those of motherhood, marital duties, healing the sick, and the working of magical spells and charms. She was believed to be the most powerful magician in the universe, owing to the fact that she had learned the secret name of Ra from the god himself. Isis was responsible helping Osiris to return to life; and for assisting her husband to rule in the Land of the Dead. There are three very distinct signatures in the NASA UFO investigation that all point to Sirius. The signatures all stem from the same phenomenon. The first signature point to Sirius is the fact that the 196, NASA STS-75 "Tether Incident" UFOs match perfectly with the ancient Chinese "Dropa Stones". When the discs inscriptions were translated, they told of crashed spacecraft from the star system of Sirius. The second signature pointing to Sirius comes from comparing Robert Temple's research about what the ancients told of the Sirians: that they are amphibious and would travel to Earth in watery-like space craft. This was synonymous with NASA scientist Dr. Louis A. Frank's discovery of 40-ton water balls the size of small houses entering and impacting with Earth's atmosphere at a rate of 10-20 million per year. the phenomenally high number of these giant water balls made it impossible for them to avoid collisions with satellites and the space shuttle if they could not intelligently maneuver themselves around these obstacles. We deducted that the phenomenon photographed by Dr. Frank was real, as he has proven it, and that the water balls must have manuevered themselves around the obstacles; thus proving they have intelligence. It was then that we saw a perfect signature match to how the ancient sources tell us that the amphibious Sirians would travel to Earth from Sirius: encased in watery-like space craft. The third signature pointing to Sirius was the simple fact that the Space shuttle was flying directly over North west Africa, the current home of the African Dogon tribe, who prophesized the return of the Sirian Nommos. The situation regarding The Sirius Mystery has changed completely since the initial edition of the book was published in 1976.1 At that time the Dogon tribal tradition insisted upon the existence of a third star in the system of Sirius which modern astronomers could not confirm. Some critics said this proved the hypothesis of the book to be false. If the Earth had been visited by intelligent beings from the system of the star Sirius in the distant past, and they had left behind all this precise information about their star system, the fact that they described the existence of a third star, a Sirius C, whose existence could not be confirmed by modern astronomy rendered the whole account untrustworthy. However, the existence of Sirius C has now been confirmed after all. happened. In 1995 the French astronomers Daniel Benest and J. L. Duvent published the results of years of study in the journal Astronomy and Astrophysics stating that a small red dwarf star, Sirius C, seems to exist in the system of the star Sirius.2 They have detected a perturbation which cannot be explained by any other means. This Verification is a highly specific astrophysical prediction which has now been confirmed. It is not as if I had predicted that, say, a comet would approach Earth in 1997. There are many comets, and one might approach Earth at any time. But when one predicts that a star will be discovered in a specific star system and that it will be a specific type of star, and when this indeed happens twenty years later, that is rewarding. What is the hypothesis, then, which has been so startlingly confirmed in the best traditions of science? It is that our planet has at some time in the past been visited by intelligent beings from the system of the star Sirius. This suggestion is no longer considered as astounding as it was in 1976. After all, The Sirius Mystery generated enormous discussion around the world, and has done so continuously since its appearance. Many years have passed and public opinion has undergone a sea change. This book seems to have founded a genre of books, and there are several bearing the names of Sirius or Orion in their titles. In the 1970s it was the 'New Agers' who were the first to adopt the sentiments of The Sirius Mystery, and my phrase 'cosmic trigger' even became the title of one of several books discussing such issues at great length. (See Bibliography for Robert Anton Wilson.) I was recently surprised to learn that the Internet has many web sites discussing The Sirius Mystery, and there seems to be a whole Sirius Industry out there in cyberspace somewhere. A friend recently asked me: 'Don't you ever use a search engine to look up "Sirius", "Dogon", etc.?' I have to admit I don't. Although I do use the Internet, I don't have time to consult websites discussing my own work -- I leave that to others -- but I am glad to learn that the interest is so large, and I just hope that they've got all the information correct. See http://www.lunaranomalies.com/temple.htm for the rest of the story. The Dogon tell the legend of the Nommos, awful-looking beings who arrived in a vessel along with fire and thunder. The Nommos, who could live on land but dwelled mostly in the sea, were part fish, like merfolk (mermaids and mermen). Similar creatures have been noted in other ancient civilizations -- Babylonia’s Oannes, Acadia’s Ea, Sumer’s Enki, and Egypt’s goddess Isis. It was from the Nommos that the Dogon claimed their knowledge of the heavens. The Nommos are a race of Beings that takes the physical forms of dolphins, whales, mermaids/mermen. Their homeworld is a planet in the Sirius star system that is mostly warm aqua-blue water. Many of the Nommos walk upright. They are known for their highly advanced used of sound. The Nommos play an important role in earth’s evolution. Right now they are the guardians and guides of the portion of Etheric Sirians who are in dolphin, whale, and mermaid/merman bodies in order to maintain the biosphere of earth. The Etheric Sirians are the soul group that were given earth as their new home when their former home, Sirius B, imploded. When Earth ascends the Etheric Sirians will take over as guardians of their planet. Those in aquatic form will have the choice to change form and take on a human body, walking the earth as a land guardian. Many of the Etheric Sirians in aquatic forms are making this choice now and, therefore, are beaching themselves. They are returning to the Nommos homeworld for training on being in a human body so that they can return to earth as land guardians. Those who are of the Etheric Sirian soul group are usually very drawn to the whales and dolphins. They also can be found in organizations and groups whose focus is healing the earth and conserving her resources. The majority of Etheric Sirians are found among the black, red and brown races of Earth. northeast of the Dogon's present homeland. When their vessel landed (after a 'spinning or whirling' descent and with a great noise and wind), it skidded to a stop, scoring the ground....At that time a new star (perhaps a mother ship) was seen in the sky." The legend depicts the “Nommos” as partly fishlike in appearance and living mostly in the sea. These creatures bear a striking similarity to the creatures called Oannes by the Babylonians and the Sumerian creature called Enki. Even the Egyptian god Isis was depicted as what would be later termed a mermaid. In all cases, these “gods” were related to the worship of Sirius. Basically, this is the Dogon mythology of the Nommos: The supreme god Amma made the whole Universe within a grain of po, which is the Dogon name for fonio, the smallest kind of millet. This grain was located inside the "egg of the world", it "spun and scattered the particles of matter in a sonorous and luminous motion", remaining, however, "inaudible and invisible" [3, p. l30]. 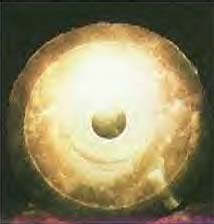 Having opened this 'egg', Amma let the spiral stellar worlds out, and it was thus that the Universe was realized. Then the god created the first living being -- Nommo anagonno. This being is described either as a half-man, half-snake having flexible limbs, without any joints, red eyes and forked tongue, or just as a fish, namely a Silurus, sheat-fish, or cat-fish. This Nommo multiplied, and there appeared four Nommos: Nommo die, Nommo titiyayne, O Nommo and, at last, Ogo, a very harmful creature. As distinct from other Nommos, he is never represented as a fish. Instead of awaiting patiently the completion of the Amma's work, he hurriedly made an "ark" and rushed into space, wishing "to look at the world". Thus, he took disorder into the young world. After several voyages, Ogo landed on the Earth and turned into the pale fox or fennec, named Yurugu. star exploded, and its brightness decreased slowly during 240 years until it completely faded. revolve eternally around his sister, remaining at a respectful distance from her. Water makes up 73 percent of the human body. 75 percent of the human brain is water and 75 percent of a living tree is water. The koala bear and the desert rat do not drink water. The average American consumes 1,500 pounds of food each year. 1,000 gallons of water are required to grow and process each pound of that food. This means that in the U.S., in a single year, an average of 1.5 million gallons of water is invested in the food eaten by just one person. This 200,000-cubic-feet-plus of water-per-person would be enough to cover a football field four feet deep.
."The images show that we have a large population of objects in the Earth's vicinity that have not been detected before," said Frank, who designed the VIS instrument. "We detect these objects at a rate that suggest Earth is being bombarded by five to 30 small comets per minute, or thousands per day." Comets are known to contain frozen water and are sometimes called "dirty snowballs". .The incoming objects, which Frank (right) estimates to be the size of a small house, pose no threat to people on Earth, nor to astronauts in orbit. "They break up and are destroyed at 600 to 15,000 miles above the Earth," Frank noted. "In fact, this relatively gentle 'cosmic rain' — which possibly contains simple organic compounds — may well have nurtured the development of life on our planet." Louis Frank's steadfast work to obtain these pictures is widely acclaimed. But not everyone accepts his interpretation of the data. There is not enough water apparent on the moon to satisfy some critics. Others complain that the seismometers on the moon haven't detected the impacts that these objects should create. And a paper in the 15 December, 1997, issue of Geophysical Research argues that the spots are merely artifacts after all. In fact, the controversy has created tension between Frank and the sceptics. Supporting evidence comes from Robert Conway, a plantary physicist at the Naval Research laboratory, who announced on August 11, 1997, that his ultraviolet telescope on the Discovery Space Shuttle had detected unexpectedly high levels of hydroxyl in the upper atmosphere. Hydroxyl comes from water vapor, possibly delivered by the newly discovered snowballs. To everyone's surprise, the objects seem to break up so much higher than they would if the atmosphere were the disrupting force. Frank proposes that Earth's magnetic field is the cause, but this mechanism needs further study. It will be interesting to see how the story unfolds. If they are real, the "gentle rain" of these objects could easily deliver viable bacterial spores and viruses to Earth. is known as "The Government" in Chinese Mythology. at (20-30 lyrs) and very close to each other too (2-5 lyrs). The Dogon, say that the drawings on the walls of their cave showed them about certain beings who came to Earth a long time ago and information about where they came from. These drawings show a flying saucer coming out of the sky, and landing on three legs. Then it depicts the beings in the ship making a big hole in the ground, filling it with water, jumping out of the ship, and into the water, and finally coming up to the edge of the water. These beings looked very much like dolphins. In fact, maybe they were dolphins, but we don’t know for certain. They then started communicating, and described where they came from, and gave the Dogon tribe this information. GREY TYPE A: This is the type most commonly referred to as the greys. Also known as Zeta Reticuli from the Zeta Reticulan star system (the Bernard star) neighboring the Orion area. GREY TYPE B: Tall Greys from Orion. Usually about 7 to 8 ft. tall (reports often exaggerate their height as being 9 to 12 ft.) with facial feature somewhat similar to grey type A with the exception of the large nose found on type B greys. GREY TYPE C: These are the shortest of the greys and tend to be about 3.5 ft. tall. Their facial features are very similar to the Zeta Reticuli greys and are of the same "root race.". They are just as hostile to humans as the Zetas. They are from a star system near the shoulder of Orion called Bellatrax. HUMAN TYPE A: These are of a genetic base similar to humans of earth. They appear of "normal" height (5-6ft?) and tend to be fair-skinned with blonde hair. These entities have been abducted by the greys or are the offspring of abductees and have been trained by the greys as servants. [GROUP A] Non Earth-Born Humans - This GROUP consists of three peoples from three distinct colony zones, namely Sirius, Pleiades and Orion. Genetically, they are nearly identical to Earth-born humans with the following exceptions. Abductees refer to these beings as the talls. Males average up to approximately seven feet in height; females, six and a half feet. They are extremely fine featured, pale in complexion. Eyes are almond shaped, slightly slanted with a natural black liner, much like the renderings of ancient Egyptian royalty. There are three hair colors apparently related to colony origin: blonde (Pleiades), red (Orion), and black (Sirius). HUMAN TYPE B: These are aliens of similar genetics to earth humans and also, it seems, of the humans that serve the greys. These are from the Pleiades and are also of the blonde, fair-skinned appearance. This type is of a genuine highly evolved, spiritual, benevolent variety and have a kinship toward humans and are the only aliens to be truly trusted by earth humans at this time.